The light tan spots in this field indicate freeze damage to the wheat crop. For wheat farmers in southwest Oklahoma the proverbial rain has hit. Not only was there severe drought damage to the winter crops, but the late freeze on April 20 sealed the deal on failed crops. Wheat can withstand a late freeze at different stages for different amounts of time. If wheat is headed it can withstand 30 degrees for up to 2 hours. If wheat is in the boot stage it can withstand 28 degrees for up to 2 hours. If the flag leaf is out it can withstand up to 26 degrees for 2 hours – the process continues. In Hobart, temperatures were documented as low 22 degrees and we were under 28 degrees for 6 hours. In layman’s terms: a disaster. Zac was with a crop adjuster all day yesterday and most of the day today. Let’s just say it was a tough 48 hours in our home realizing that 80% of our main crop was not harvestable. Today Zac is swathing his Ruby Lee seed wheat – because the head is dead inside the stalk. The problem we will be experiencing for the 2015 crop year is the significant loss of seed to plant for future crops. But this is nature’s way of ensuring the strong will survive. Our faith will remain strong in Jesus Christ, this isn’t the end but the beginning. He always provides! On another note, Washington, D.C. legislative action tour was great. Getting to hear from the Oklahoma delegation makes us feel like we could be a part of the only sane state in the U.S., trying to bring common sense back to Washington. With the prospective light frost, we will see if the fresh milo that is coming up can survive. This will definitely be a crucial year for many farmers. The wise ones will be here to farm another year and the not so wise might not be. It’s a make or break year in Oklahoma! This will take years for farmers to recover from the continuous drought we have seen. Greetings from the Leonard house. This is Katy writing this week. Who would have thought that a month ago we would be sitting and waiting for it to dry out after approximately 15 inches of rain in the last two weeks? Two weeks ago my dad had surgery on his elbow and wrist. So he has become the one arm bandit and the drill sergeant. We, as in Kody, mom, and I, decided that we were going to take him on vacation to Palm Coast, Florida, for a week. The Leonard Family visiting the Daytona International Speedway. While we were in Florida we visited St. Augustine which just happens to be the oldest town in the U.S. We also visited Daytona Beach and with the NASCAR fanatics that are in my family, we had to go to the Daytona International Speedway and go on an hour and a half tour of the speedway. Also, while we were in Daytona Beach we visited Bubba Gump’s. While we were there we saw several people fishing on the shore at the beach. We asked one of the guys fishing if they caught very many and he said one day he caught 16 baby sharks. He said if people really knew what was swimming in the water they might think twice before going in the water. Mom and I enjoyed searching for shells each day. We returned early Saturday morning after dad had got lost in Kansas City, Missouri. Okay, now it’s time for dad’s views. It’s so amazing how a year can be so different from the one before it. This year started off very dry then got very wet from March through the first of June and then no rain for 60 days and now it has rained over 20 inches in the last three weeks. From a crop producing viewpoint, crops don’t grow well in either extreme too wet or too dry. That being said, here is this year’s crop report so far. Water standing in a field at the Leonard farm. Wheat was very good but about a week later than normal in harvesting. Corn was a disaster from start to finish. It was too wet which caused us to be working the ground too wet which caused compaction on what ground we were able to get planted. Then it got hot and dry in June and July which made the ground get very hard. The roots of the plants hadn’t gone very deep because of the early wet ground and then when it did try to pollinate we had near 100 degree temperatures and very dry conditions. Now with the 20 inches of rain in the last three weeks, the corn has suckered out and greened up and is even growing new ears but with no pollen left they are only blank ears. So corn harvest, when it does ever come about, will be late and short as we only got less than half the acres planted that we wanted to. Milo that got planted late when the corn didn’t get planted looks good now and is heading out. I have never seen milo this tall but then again I have never seen this much rainfall in the first of August either. Soybeans that got a stand in the dry soils of July now are dealing with the third week of water standing on top of the ground and not enough oxygen in the root zone in the soil. So they are very yellow looking but still growing. The biggest issue with the soybeans now is the Roundup resistant weeds and the fact that we can’t get across the ground to spray the weeds. We are all busy getting ready for school and the county fair, going to workshops and preparing for the new year of seed sales. The Leonard family enjoys their vacation in Daytona Beach. Water standing in the crops on the Leonard farm. More standing water on the Leonard farm. More water causing problems and flooding this county road. Katy Leonard showing her lamb at the county fair. Planting potatoes is a family event on the Harris farm. Well I hope everyone has enjoyed this beautiful spring weather we have been having! Oh but wait, it’s Oklahoma and as the old saying goes, “If you don’t like the weather, wait ‘til tomorrow!” That has definitely turned out to be true during this spring break! Harris Farms has had a productive couple of weeks … our garden finally has potatoes planted. We finished them on the 15th, barely in time by the traditional St. Patrick’s Day deadline! Onions are in the ground ­- Amy is taking a stab at potatoes again; last year was not successful, so she’s hoping this year is better. Any potato experts out there, please don’t mock our planting abilities! We purchased baby chicks to finally go in the chicken coop Amy’s dad built a year ago! The kids are super excited, but Amy is not happy about the funny smells from the mud room. Yesterday a few started flying out of the box we had them in, so they graduated to an empty stock tank. I think Amy is counting down until they can go officially outside, but with this cold snap, it may not happen as soon as she would like. Paw Paw and the Harris kids with a new shredder. I was busy moving cows to spring pastures last week, so I didn’t get to go to the Young Farmers and Ranchers Legislative Day at the Capitol. I kept the three small children so Amy could go. After hearing all she had to say, I almost wish I would have dusted off my tie and made the trip! Representative Todd Russ and Senator Mike Schulz are so ag friendly I knew I didn’t have anything to worry about, but Amy spoke with each of them for about 45 minutes. Something Senator Schultz said that really struck Amy was, “You can’t have freedom without responsibility.” That statement carries so much weight. If we as Americans aren’t willing to take responsibility for things like protecting the environment, caring for those in need, etc., the government will be happy to take that responsibility, but with that comes greater regulations and taxation just to name a few. Something else that was discussed during the luncheon was the rainfall. Get ready, there was a prediction made that we will only see 1.5 inches of rain during the months of June, July and August. So as much as we would like to avoid the topic of drought and set aside all the worry that comes along with drought, I do believe it is here and not leaving anytime soon. Also, some concern from the legislators is that water is not really a topic at the Capitol and we should be screaming it. A story was told about some friends in Lubbock that their water bill is twice whatour electric bill is in any given month. The fact remains here in Oklahoma we don’t pay for water when we pay our water bill, we pay for the infrastructure and maintenance. My food for thought is how would our usage of water change if we had to start paying for the water that runs through the tap? Or what if you were only allotted 250 gallons a month? What would we give up? Food, water and shelter are the 3 biggest needs of survival. You can survive 10 days without food, but only 3 without water! Kenda showing her miniature Hereford at the 2013 Oklahoma Youth Expo in Oklahoma City. We were able to enjoy the Oklahoma Youth Expo. The staff did a great job with the schedule changes and additions, such as Miniature Hereford Steer Show. Kenda was first in her class. I think there was 11 head and 5 classes. Such fun to watch 4-year-olds to 9-year-olds in the ring handling these animals. We finished top dressing the wheat with fertilizer about 10 days ago. The crop adjuster was out about that time and disastered out about 150 acres and will be back out to do a tiller count in about 10 more days. What has been disastered already will be planted to milo after this cold snap is over, with hopes of harvesting in July. A lot of our neighbors have had to spray for bugs in the wheat. We chose not to spray this year for three reasons. The first reason is I haven’t seen a lot of bugs in our wheat and, the second reason is that wheat can outgrow a small bug problem and with the weather and the rainfall coming at the right time I think it will outgrow that problem fairly quickly. Thirdly, I used sulfur in our topdress and bugs do not like it. I hope I’m right. The threat of severe weather last week had us scrambling to get everything parked in the barn before nightfall. It’s that time of year again. It’s probably a good thing that farmers are optimistic, especially considering that in the last 18 months we’ve experienced record cold, record heat, record drought, and record flooding. In our area, the old saying of “don’t count your chickens before they hatch,” has been ringing true. Of all of the various tasks that come with our job, risk management is probably among the most critical. I think having the opportunity to carry insurance on our grain crops is very important to the longevity of our operations, especially with the never ending increase in our cost of production. I know when we pay our premiums that it seems expensive, but losing the money we spend to grow a crop would take several years of net profit to recover without a safety net below us. As our legislators shape our farm policies, I continue to hope they will appreciate the amount of risks we are willing to take to successfully provide food and fiber for our nation and the world. 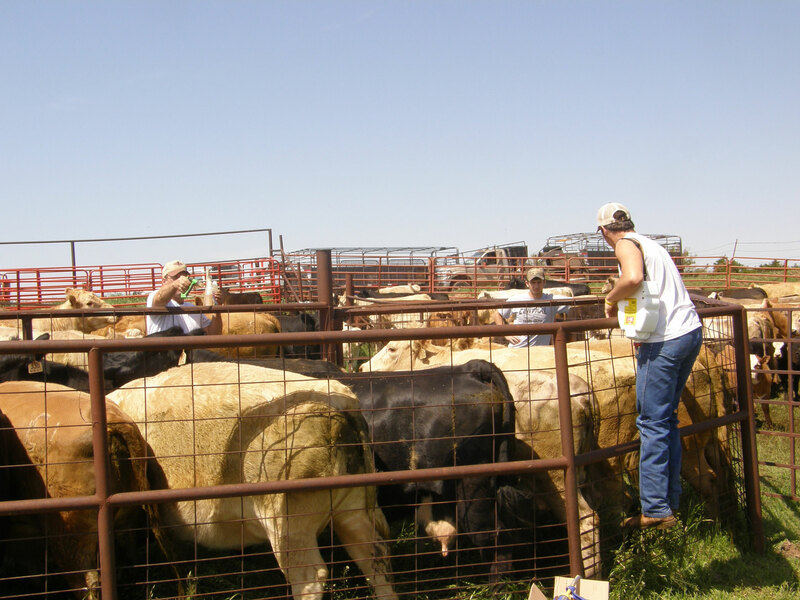 Loading cattle to take home to our working facilities. being early this spring, the flies are early too. We poured fly dope on both the cows and calves and put a fly ear tag in each of the calves. It’s almost miraculous to see the flies just “disappear” by the time we’re finished working the cattle. I was pleased to see the good growth on the calves and the good shape the momma’s are carrying into the spring. Our sons applying fly dope to our cattle to cut down on fly problems this spring. We started custom wicking feral rye in wheat fields a few days ago. We’ve got about two weeks worth of custom hire lined up so far. We plan to start swathing our hay this week. It’s a busy time of year. We generally start cutting wheat around the 4th of June and it looks like this year we might be finished cutting wheat by then if things continue to remain so far ahead of schedule. Only once do I remember cutting wheat in May. Clayton has built up over 40 hours of flight time now toward his helicopter license. He will soon take his written test and then solo for the first time. We are excited with him as he progresses. Wade has 3 baseball games in a tournament at Ringwood this week. 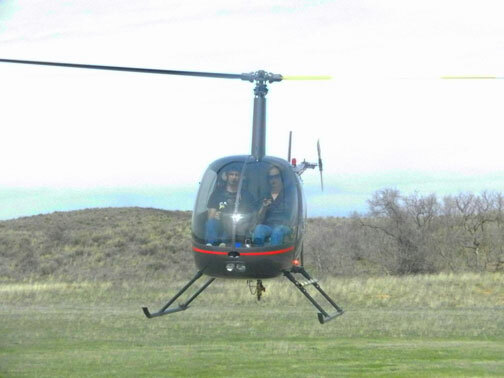 Our son, Clayton, taking another helicopter lesson with his instructor. 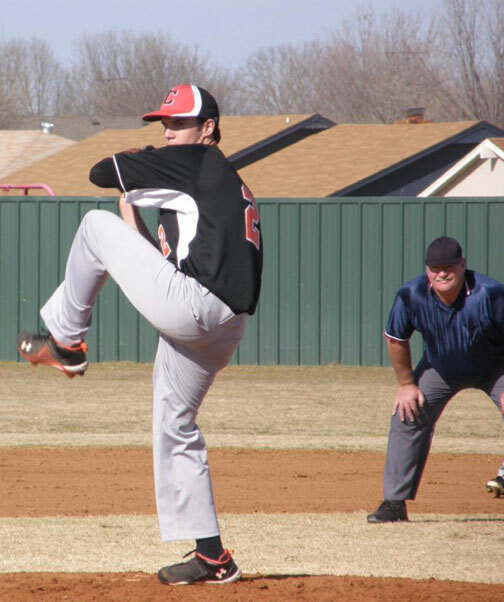 Our son, Wade, pitching at a baseball game in Calumet. 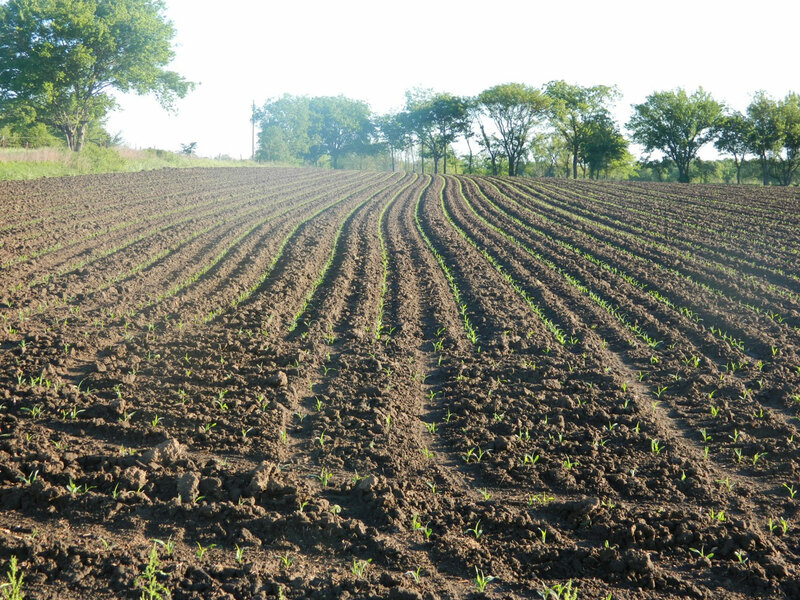 The corn looks beautiful as it pops up through the earth in rows. but this year we had to wait a few days for the soil to dry out. All of our corn is dry land, upland corn, meaning we don’t irrigate it and it’s not in river bottomland. I planted about 19000 seeds per acre or less. Seeds are expensive and crop insurance doesn’t cover corn in Creek County. These warm moist days have given us a good stand. As always, we are hoping for continued moisture with no hail.